At NAB 2014 in California, Avid has given us a preview of a number of new features and workflows for Pro Tools 11. Seamless online collaboration is one of them. For this to work flawlessly though Pro Tools has to gain new functionality and features. That’s exactly what Avid has planned for us. At the beginning of this year’s NAB, Avid revealed its Avid Everywhere strategy. A whole new workflow was hinted at. A new Marketplace is supposed to connect content creators with consumers. It will allow you to sell your original content with rich metadata and digital rights management. Plus it will offer purchase and license agreements for customers in need of unique content. All within one Marketplace that offers a streamlined upload and transactions experience. It wasn’t very clear how this whole new workflow would play out inside Pro Tools. Obviously new technology and features would have to be added if this were to truly work transparently. Today though information regarding new features in an as of yet unannounced version of Pro Tools have been revealed. Suddenly the whole process becomes a lot clearer and very, very interesting indeed. First of all let me say that all this information comes from a sneak preview and is in no way a guarantee that it will be released as shown nor when it exactly will be released. Avid showed us an updated Marketplace via which you can commence collaboration with other Pro Tools users. This works with a new ‘intelligent’ Avid Account which you can use to contact other users and invite them for a text chat, video conference or to start a collaboration. A collaboration can be for a single track or a whole session. This is determined in a new Collaboration View in Pro Tools’ Edit window. The view contains multiple new buttons. One of them has a small ‘avatar’ symbol. You use this to set the tracks, that you want someone else to work on, in collaboration mode. Another new upload button in the collaboration view, allows you to ‘Freeze’ those tracks, yep you read it correctly, and send it into the cloud. The person you contacted via the Marketplace window will then receive an invitation to collaborate. 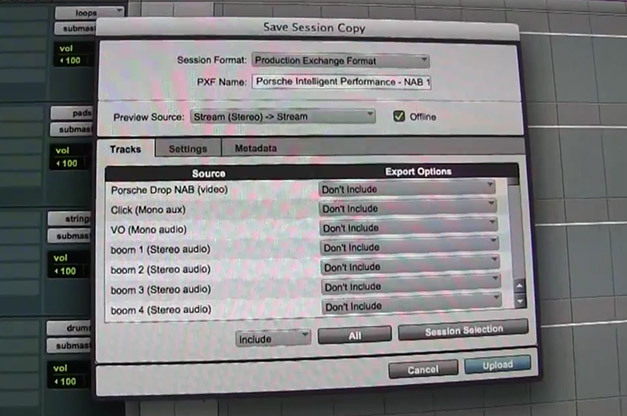 After accepting the invitation he or she will be able to download a new PXF (Production Exchange Format) file that will open a session in Pro Tools showing only the tracks that you put in collaboration mode. The collaborator can then record new tracks and send these back to the person that shared them. This is done via the same process using the buttons in the Collaboration View. 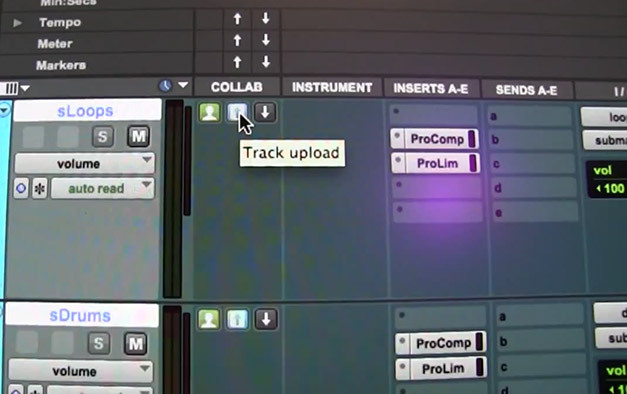 When new tracks or changes are available to either person, the download button in the main toolbar of Pro Tools will turn orange indicating. Clicking this will create for instance new tracks and start downloading the new Clips. It would be a very nice touch if you can set some sort of privileges for collaboration that determine what the person on the other end can do with the shared tracks. Something like turning on editing of clips, moving clips et cetera. If the collaborator sent you a track on which he or she used a plug-in that you don’t have, you will be warned via a pop-up window as soon as you try to unfreeze the track. You Then have the option to either purchase or rent this plug-in directly from within Avid’s Marketplace. This instantly installs the plug-in without you having to close the session. You can start using the plug-in right away and tweak its settings for your mix. Of course you can also choose to take out the plug-in, exchange it with your own, or stick to the frozen track. By this time you must have realised that Pro Tools finally has the highly coveted ‘Freeze’ Track function. Tracks in the new to be released Pro Tools version, all sport a new button with the symbol of a small snowflake. This allows you to render all the effect plug-ins on a track to save processing power. All inserts on a ‘frozen’ track will become inactive and receive that same snowflake symbol, informing you that the inserts are currently frozen. It would be very cool (no pun intended) if you could take individual plug-ins out of freeze mode by clicking the snow flakes on the inserts. But that is just me fantasizing and hasn’t been shown by Avid. Freezing tracks is nothing new. Many other DAWS already have a comparable function. Avid though has managed to implement it in a sophisticated way. Right-clicking with your mouse on the Freeze button shows a pull-down menu with the option to unfreeze, Commit the effect plug-ins to your track or commit the effects to a newly created track. Some fantastic options for the freeze function if you ask me. 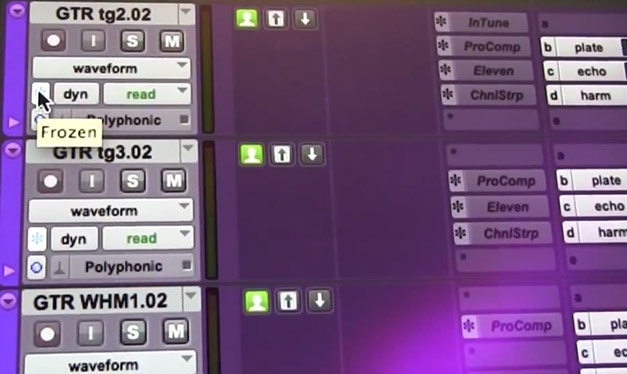 A new Stream button in the toolbar of Pro Tools allows you to stream the session to, like say, the producer in realtime. Avid will actually release an iOS, Android and Windows app that allows someone to control the playback, rewind and fast forward of a session over the internet and hear the session play. Changes to the project can then be suggested, tried, and discussed live while the producer is on the other end of world for example. The Save Session Copy dialog has received a complete overhaul with a new tab based division. You have a tab called Tracks for selecting which tracks to save. A tab called Settings allows you to determine how you want to save your copy and there’s a new Metadata tab which we haven’t seen yet. Clips that are created by a collaborator show the avatar of that person. The files of those clips have the identity of the collaborator embedded. This is a fantastic new way of keeping track of who created what in a session for digital rights management. After you are finished with your session you can post your session to the Avid Marketplace. This allows you to sell or license the session to others worldwide. When posting the session you can give it a title, an image, a description, tags and you can set a selling price. The Tempo, Meter and Markers Rulers also have an Upload and Download button. This suggests that you can individually send and receive these to and from collaborators. For instance after someone adds a tempo change or a new marker. In my opinion two of the most important things that we learn from this news is that Avid truly listens to what we Pro Tools users have been asking for the last few years in forums and on the Pro Tools Ideascale website. It might not be as fast as we would want to but we are definitely getting it. The second is that Avid can still innovate. This whole new implementation of collaboration looks very slick. Online collaboration in itself is nothing new. We already bounced files and sent them across the web to collaborate with other musicians, editors and producers. But the way Avid presents it in Pro Tools, could very well put Pro Tools’ roots even firmer in the ground as the industry standard DAW. Watch this Youtube video in which the features are shown for the first time and see how Track Freeze works inside Pro Tools. Do you get the full potential of how this collaboration workflow could change the way we work? I for one am very excited. For more information on the whole concept visit the Avid Everywhere website.